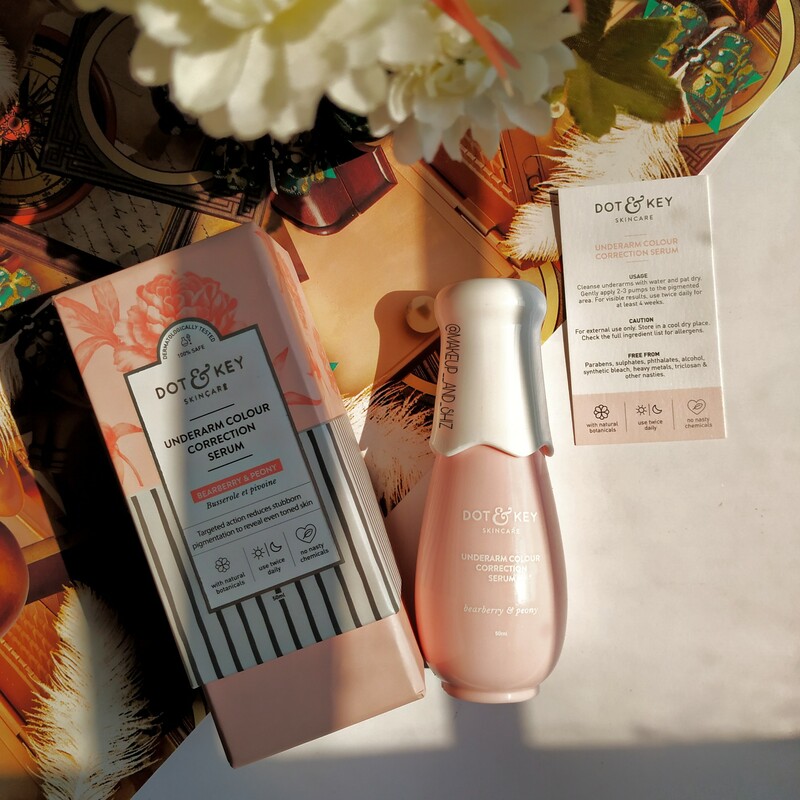 Dot and Key Underarm Colour Correction Serum– Review. A few days ago, Dot & Key sent me their products . I will be reviewing the colour correction serum. Underarms can become darker than the natural skin tone due to a host of factors including poor ventilation, excessive sweating and the accumulation of dead skin cells. Dot & Key Underarm Colour Correction Serum, specifically designed for tender underarm skin, penetrates deeply to eliminate this pigmentation and roughness. With zero nasty chemicals, this underarm whitening cream serum is completely safe and gentle on skin. Its carefully formulated skin lightening botanical system contains the goodness of Uva ursi (bearberry) leaf and Paeonia suffruticosa (peony) root which corrects uneven skin tone of dark underarms by significantly deterring the production of melanin without any toxicity or side-effects. It minimizes the area of rigid pigmentation and brightens the complexion, creating an even tone on all skin types. The result? Soft, smooth, evenly toned underarms in a matter of weeks. *It contains Magnesium Ascorbyl phosphate , which is a stable form of Vitamin C ( ascorbic acid ). Sodium benzoate is a preservative used , which is safe itself but forms a carcinogen when used with Vitamin C. But then it is safe to use it with Magnesium Ascorbyl phosphate. It doesn’t react to form carcinogen ( benzene ). It comes in a cute outer covering which looks very luxurious. Once you open the outer packaging , you see the serum bottle inside. The cap in tightly placed. And the best part ? It has a pump bottle , therefore very clean , very hygienic and doesn’t mess up. The pump is bit tight towards the starting , with regular use you will get used to it. Use it daily after a shower. Cleanse underarms with water and pat dry. Gently apply 2-3 pumps of the skin lightening serum to pigmented area. For best results, use twice daily for at least 4 weeks. For best results, use with Dot & Key Underarm Detox & Colour Correction Mask. Well , it has been 20 days since I am using Dot and Key Underm Colour correction serum and I have definitely seen changes in my underarm. Being a PCOD patient , dark underarms are always a problem for me. With constant use for two weeks , my under arms definitely look much more cleaner and has reduced amount of pigmentation ! Also not to forget , the serum has water like consistency . Neither too thick or thin . It also has a cooling effect ( which I pretty much love about it , lasts for about 15-30 mins ) and smells good. Thus , it gives a feeling of freshness! Also Read :Fabeya Shea Butter Body Scrub and Polish- Review. Previous Dot and Key Hand Cream Sanitizer+ Moisturizer – Mandarin & Lime — Review. Next Blue Heaven Non Transfer Lipstick – 711 Brown Twig, Review & Swatches.